Let the soft flicker of candle light lend your living space a touch of romance. 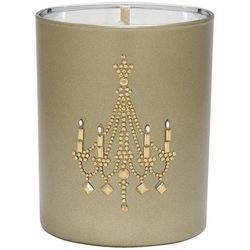 This Vintage Icon scented candle features an elegant image of a Parisian chandelier that has been hand-jeweled with metal studs on antique gold metallic glass. This 9 ounce candle is hand-poured with vegetable and soy blend wax, and a decadent sweet spun sugar scent. Comes with a matching hand-jeweled gift box, making it great for gift giving. • Antique gold metallic glass. • Hand-poured vegetable and soy blend wax. • Cotton lead free wicks. • Decadent sweet spun sugar scent. • 9 ounces; 50 hours average burn time.